On February 26, 2010, the Constitutional Court in Colombia ruled as unconstitutional the law that called for a national referendum to put to the people the question of whether or not to allow President Uribe to run for a third consecutive term. This was a decision of the utmost importance for it restored faith in the institutional balance of power. As argued elsewhere*, such balance had been endangered by Uribe’s stubborn whim to remain in office. Although in retrospect it may seem quite obvious that the Court was going to rule against the referendum law, as has been recently suggested in the media, it should be stressed that there was tremendous uncertainty as to how the Court was going to decide and either possibility appeared feasible. I wish to offer here a brief commentary on why it now is apparent that the referendum law was unconstitutional. As the Court’s majority argued, the referendum accumulated a series of grotesque procedural flaws that severely compromised its nature as a popular initiative. Instead, it became the project of a minority that squandered no effort to impose its views upon the rest of us. Fortunately for Colombia and its democratic institutions, the Court ended the tribulations inflicted on the country by Uribe’s love affair with power. The Court, which has automatic revision powers of referendum laws, had announced that it would render a decision on February 26, and considerable anxiety prevailed about its ruling. Many people closely monitored the news over the Internet or the radio. The result was projected as if it were a football match: 6-3, 7-2, 8-1?! Around 5 p.m., the Court announced that it had ruled against the referendum law with a 7-2 vote. Bliss. The ruling focused on five procedural flaws. Contrary to what happened in the previous decision (yes, Uribe engineered a constitutional reform that allowed him to run for re-election in 2006) in which the Court focused on the substance of the case, this time around it dealt mainly with procedural issues. These were not insubstantial; quite the contrary, these formalities ̶explicit in the Constitution ̶ guarantee that the will of the people is preserved. The first flaw is related to the funding of the referendum project. The Constitution allows the people to initiate legislation as long as at least 5% of those allowed to vote support the initiative. Referendum promoters raised the funds required to collect the required one million signatures, but they did so cavalierly, ignoring the legal limitations imposed on such activities. The referendum records are murky and plagued with irregularities, such as self-loans between organizers that deliberately attempted to obscure the way in which the referendum was financed. According to Semana,** promoters spent six times more than the spending cap permitted, there were individual contributions that were as high as 30 times more than the allowed amount, and in excess of 60% of those who violated individual contribution caps were state contractors. The Court asserted that the promoters violated the law with their careless fund raising. The second flaw is closely related to the first. The law further requires that the National Registrar (whose office is in charge of elections) certify that the collection of signatures backing the initiative complies with the legal requisites before Congress considers the bill. The National Registrar did not (could not) make such a certification. Nevertheless, Congress went ahead with the referendum bill with haughty disregard of the proper legal requirements. The Court’s majority opinion states that “this certification is a fundamental element in the legitimacy of the referendum initiative because it serves as a safeguard of democracy, avoiding that participation mechanisms, such as legislative initiatives, become instruments of groups which, with enough money and no limits on the resources that they may use, end up appropriating the will of the people (…) completely blurring [the participatory mechanisms’] essence.”*** (My translation). As crafty as they were in cooking their books, promoters of the referendum clearly do not excel in terms of other basic skills such as reading and writing. It turns out that the convoluted petition that one million or so Colombians signed was phrased as to allow Uribe to run again in 2014. Congress remedied this ambiguity by changing the wording of the question on its third hearing in a Senate committee. The Court did not meander in this tomato-tomahto issue. Rather, it maintained that Congress extra-limited itself as it was not allowed to make those changes at such an advanced stage in the bill’s discussion. A fourth flaw emerged in September, 2009 when the bill received its final vote in the House’s Conciliation Committee. The bill attained an agonizing majority of 85 votes (an excess of one vote) because five congresspeople abandoned their party and joined the Uribista Partido de la U. The Court ruled that those votes were not valid because these five legislators had been sanctioned by their original party, Cambio Radical, because they did not share the party’s position with regard to how to vote the referendum. CR’s Ethics Committee sanctioned them by forbidding them to vote on the bill. Despite their flamboyant camisetazo, they were allowed to vote. By striking down those votes, the Court claimed that the referendum failed to attain a necessary majority, indicating that the bill actually failed to pass. Finally, the Court also ruled the law as unconstitutional because of the boorish way in which the executive branch called for an extraordinary session in December 2008. Ordinary sessions expire every year at midnight on December 16. On that night in 2008, the referendum bill was still under debate on the House floor. As midnight arrived, the House failed to vote. In a desperate yet clearly orchestrated fashion, the Minister of Interior pulled out of his briefcase a signed decree convening Congress to an extraordinary session in an effort to maintain the quorum. The extra session began promptly at 00:05, December 17, and eventually the House approved the law. However, as the Court noted, the executive branch is required to publish in the Diario Oficial decrees that convene Congress for extraordinary sessions. The decree was published on December 17, at 16:44, well after the session had ended. Therefore, the Court ruled the extraordinary sessions were not valid. After considering the arguments put forth by the Court, it is difficult to see how the Court could have decided differently. In fact, it is surprising that the vote was not 9-0. Well, it actually is not all that surprising if one accounts for which justices constituted the minority opinion. Uribe nominated three of the sitting justice, and two of them voted in favor of the referendum initiative. One of the dissenting justices, Mauricio González, served as chief legal aide to Uribe prior to his Court appointment. The other minority Justice, Jorge Pretelt, is Uribe’s close friend and also happens to be the cousin of Sabas Pretelt, Uribe’s former Minister of Interior. However, it was not until the decision was known that the uncertainty ended. Uribe, albeit tacitly, had given every indication that he fervently desired to be re-elected yet again. Had that been the case, Colombia’s democratic framework would have been seriously compromised as the Constitution’s checks and balances were not designed to withstand a mighty Uribe with intentions to perpetuate himself in power, à la Chaves or Fujimori. The Court’s ruling preserves the forms of Colombia’s democracy, at least for now. * Botero, Felipe, Gary Hoskin and Mónica Pachón. 2010 (forthcoming). “Sobre forma y sustancia. 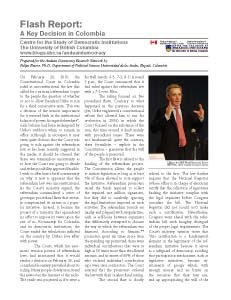 Una evaluación de la democracia electoral en Colombia.” Revista de Ciencia Política, 29(1). ** “Los puntos clave de la ponencia de Sierra Porto”. Online at http://is.gd/advpn (redirects to Semana‘s article). *** “Esta es la ponencia de Humberto Sierra Porto que dice ‘no’ al referendo reeleccionista”. Online at http://is.gd/advMu (redirects to excerpts from the majority opinion as published in El Tiempo).